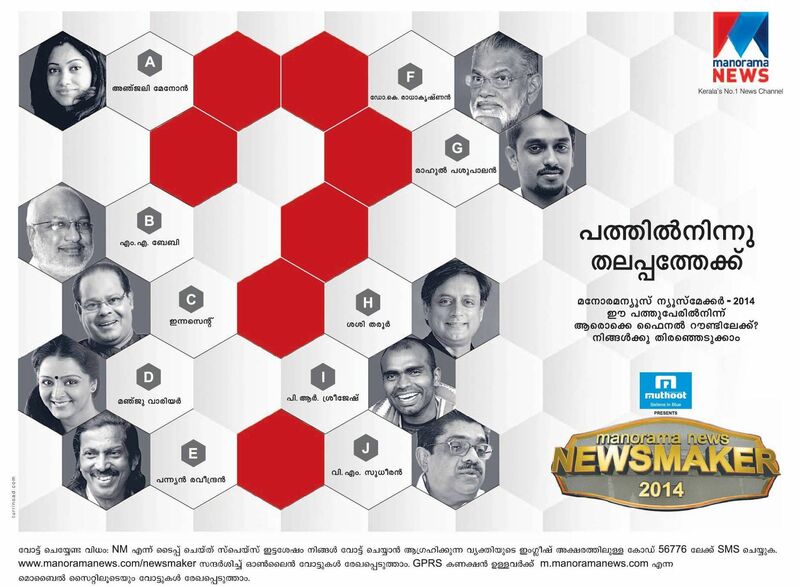 we have already posted about the manorama newsmaker 2014, and also posted the 10 persons list. Dr. K. Radhakrishnan, VM Sudheeran, Pannyan Raveendran, M.A Baby, Dr. Shashi Tharoor, Innocent , Manju Warrier , Anjali Menon, PR Sreejesh, Rahul Pasupalan are now listed. SMS Voting for Manorama Newsmaker 2014 – TYpe NM and Space and Type The Alphabet Code of The Person (For Example J is for VM Sudheeran) and Send it to 56776. Online Voting of Manorama Newsmaker 2014 – Visit www.manoramanews.com/newsmaker and Vote. Mobile Users With GPRS Connection – Visit http://m.manoramaonline.com and cast your vote. Dr radhakrinan. We need respect to him. Coz he has done good job for India.